I made Fetching for Laura’s birthday present. The yarn is Moda Dea Eclipse 60% extra fine wool / 40% nylon in Linen (2551). I had to do several modifications to get them small enough to fit her 6″ wrists. 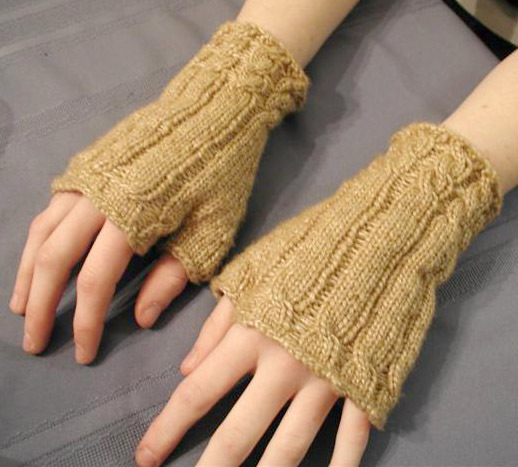 I used size US 5 needles. I also only cast on 40 stitches (instead of 45), which got rid of one cable repeat around. 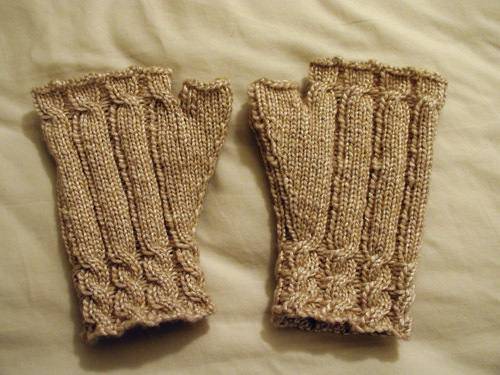 I did a 3″ thumb gusset instead of following the pattern’s thumb instructions. about your projects. I love knitting and crochet myself.